Buying the best quality clothes for your spring-time outdoor adventures. This winter I had the opportunity to visit the Ex-Officio booth at the TGA 2011 trade show. I was struck by the breadth of their line and the sharp looking new additions for 2011. I’ve been a raving fan of their Air Strip shirts for at least the last five years or so. I’ve got both their long sleeve and short sleeve models, but I find myself using the long sleeve shirts much more than the short sleeve. With most locations I visit, I find that having the long sleeves for the morning chill and that “after the sun goes down” temperature drop to be a real advantage. During the heat of the day, the sleeves easily roll up and are held there with a button tab. It’s the best of both worlds. Last summer I wanted to photograph the sunrise over Haleakala Crater on the island of Maui. Despite the 80 degree days in August in Hawaii, the temperature drops to about 40 degrees in the early morning hours at the top of the mountain. I hadn’t packed a coat, but I used the long sleeve shirt like a jacket over another shirt and it really helped keep me warm. I can’t think of a trip I’ve gone on in the last couple years where a long sleeve Air Strip shirt hasn’t been in my bag. I’ve always liked lightweight hiking pants for camping, photography and general all-round outdoor activities. I’ve gone through dozens of pairs. This year I tried the Nomad pants from Ex-Officio for the first time. After a dozen uses already, these have moved to the top of my favorites list. 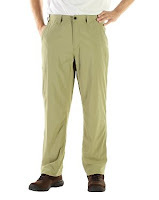 Super light-weight but durable are the two marks of a great pair of outdoor adventure slacks. These are probably the lightest feeling slacks I’ve tried, but at the same time, they’ve resisted scuffing and one experience hiking where I thought they would surely tear. Nothing…came through without a scratch. Lest you think these are for outdoor only, think again. With the nice clean cut of these pants, I threw on a sweater and a sport coat and used these for fine dining one evening. 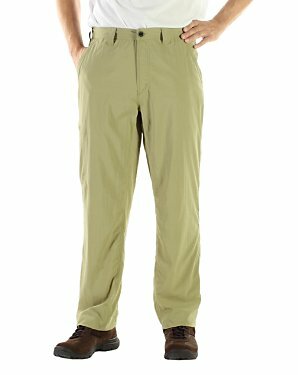 With their wrinkle resistant finish and drop-in cellphone pocket, this will quickly become your goto slacks. Ex-Officio now has now expanded their line of underwear for women as well as men. All are designed to be lightweight and easy to care for while on the road. This was the first time I had tried the men’s boxers however. With 94% nylon and 6% spandex, they are going to fit better than most – no matter what type of body profile you have. With just a touch of stretchiness, they kept the bottoms snugly around my legs and did not ride up, no matter what type activity I was involved in. With this type underwear, you really could go away for weeks at a time and only have to pack two pairs. They can be washed out in the sink and dried in no time at all. After washing and wringing them out over the sink, I always take one of my dry towels and lay the pants out flat on the towel. Then starting at one end, I roll the towel as tightly as possible until the entire shorts are enclosed in the towel roll. I then squeeze the entire length of the towel and unroll it again. At this point, probably 90% of the moisture is out of the shorts and I just hang them from a towel rod or door knob. By morning, they are invariably perfectly dry and ready to wear or repack. You can check out the entire line of Ex-Officio outdoor clothing at their website.